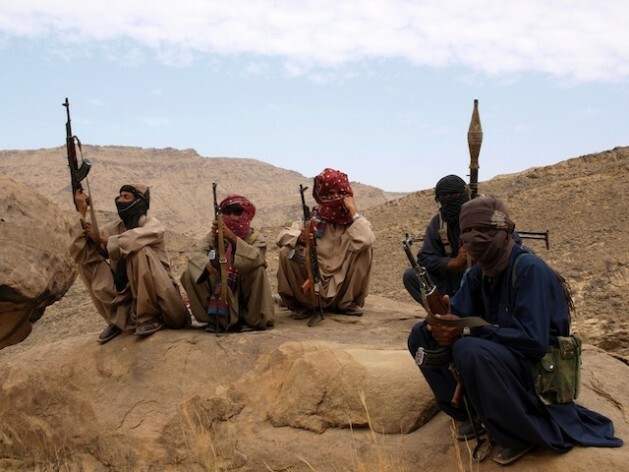 Baloch fighters at a location in Pakistan. Credit: Karlos Zurutuza/IPS. ISLAMABAD, Jul 20 2018 (IPS) - Last week, 200 people were injured and 131 died in a suicide bombing in Mastung, Baluchistan. This attack was second most deadly since the 2014 Army Public School Attack in Peshawar, KhyberPukhtunkwah, which killed 144 people. This recent attack was one of three in 72 hours related to the country’s upcoming elections on July 25.Terrorist attacks are not new in my country. Pakistan has lost over 50,000 civilians in terror-related deaths since 2003. For me, the latest deadly suicide bombing triggered traumatic memories and an acute reminder that Pakistan, and the world, need preemptive and inclusive conflict prevention if we are to stem the tide of growing violence. Nine years ago, I participated in Pakistan‘s war on terrorism against the Taliban as a Pakistan Air Force officer stationed at Pakistan’s conflict torn province of Khyber Pukhtunkhwah. On 16 October, 2009, while going home to celebrate my birthday with my only daughter, I was stopped by the police who told me that a suicide bomber had exploded near the residential complex where my house was situated. My then three-year-old daughter was in the house at the time. I was asked to go on foot to my house. What is important for conflict prevention is knowing that a cause of terrorism is a sense of relative deprivation. Social scientists have long acknowledged that people evaluate their own wellbeing not only based on what they have but also based on what they have relative to what other people have. The 13-minute walk to my house was the hardest of my life. My only thoughts were why this was not prevented and how much personal cost I would bear for this war. I could smell burnt flesh, saw bloody bodies and felt broken glass under my feet. I saw the young happy cobbler’s charred and shrapnel ridden dead body in front of me. He had come to the city so that he could earn a living and let his daughters study. My own daughter survived the bombing, but she was traumatized for a very long time. That one day changed my perception of peace and conflict forever. Despite being in internal conflict for a very long time, Pakistan has not learned the art of preemptive conflict prevention. Conflict prevention is defined as not only controlling the damage caused by conflict but also targeting the underlying causes of conflicts to avoid recurrence. Development remains a potent tool for conflict prevention. Conflict prevention efforts can save both lives and money. The cost savings could be up to US$70 billion per year globally given that two billion people live in countries where economic stability and opportunity are affected by fragility, conflict, and violence and conflicts derive 80% of all the humanitarian needs. Of course, the horrors of terrorism cannot be captured by using statistics alone. Terrorism destroys way of life, inculcates lingering fear and leaves survivors traumatized for life, as my daughter and I can attest. What is important for conflict prevention is knowing that a cause of terrorism is a sense of relative deprivation. Social scientists have long acknowledged that people evaluate their own wellbeing not only based on what they have but also based on what they have relative to what other people have. Discontent and inequality in access to resources remain an important cause of conflict. Development strategies target exactly that. In the case of Pakistan, the military has a very heavy involvement in the foreign policy and counter terrorism strategies. This may halt conflict and give a sense of peace, but it’s a fragile peace imposed on people instead of coming from them. This remains a handicap for Pakistan that has not been able to foster positive and sustainable peace through development as a conflict prevention strategy. In Pakistan, most of the terrorist attacks happen in two of its provinces: Khyber Pukhtunkhwah and Baluchistan where there is a long history of unresolved grievances against the Federation and its biggest province Punjab. These areas are navigating a very complex conflict nexus that includes the Taliban, Daesh and internal separatists, but it is also a source of conflict that these provinces overwhelmingly see themselves as deprived in comparison the affluent province of Punjab. As much as intelligence and military efforts help to curb terror attacks, targeting underlying causes of conflicts requires the inclusion of a broader group of stakeholders, such as the government, community leaders, military, civilians and media. Today, militaries in many conflict ridden countries — including Pakistan —drive the process of conflict resolution. This needs to change. Peacebuilding needs the inclusion of all other stakeholders to make the process of conflict resolution—as well as prevention—feasible. All other parts of society need to step up and demand their voices be heard. Until now, the world and Pakistan have been failing at conflict prevention because we’ve relied on military forces alone. We have paid a high cost through instability and recurrent loss of lives. At the same time, civil society has been driving for democracy through events like the Arab Spring. Today we need the same kind of movement to make conflict prevention a priority for the world. Indeed, a “Prevention Spring”—a time when civil society focuses on building more equitable societies rather than preventing conflict—may well be the solution to making the world peaceful.